The United States men’s national team was drawn into the 2014 World Cup Group of Death on Friday, set to face two of their biggest nemeses in Germany and Ghana, with a brutal game against Portugal in the heat of the Amazon for good measure. It is easily the toughest test the Americans have faced to date, and will present manager Jurgen Klinsmann with a set of harsh challenges this June. And that may be the story of this World Cup: Friday’s draw produced a massively imbalanced set of games, with several big names — Colombia, France, Belgium, Argentina and the hosts – all getting what on paper seems like an easy ticket to the next round. Some early first-round matches also look unwatchable, with Groups C, E and H putting up some very uncompetitive pairings. 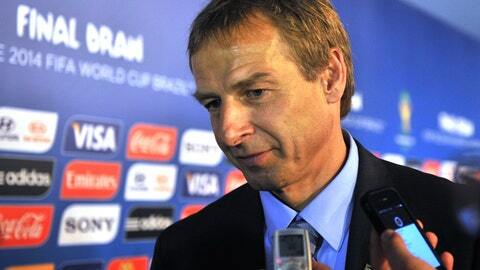 All eyes will be on Group G, where the Americans will face a German side that ejected them from the 2002 quarterfinals, and whom Jurgen Klinsmann won the World Cup with as a player in 1990. They also must face a Ghana side that has bedeviled the American soccer team at both the youth and full international level. Notably, the USA were ejected from the 2010 edition of the tournament in the round of 16, when Asamoah Gyan scored in extra time to crush Bob Bradley’s team’s dreams. England will also be ruing their luck as they must face Italy in the Amazon in their opening match. While the game will be played at 9 p.m. local time, Manaus is the most feared of the venues in this tournament, and manager Roy Hodgson said pre-tournament that he was hoping he could avoid the locale. His England side now gets the joy of facing stars Luis Suarez and Mario Balotelli in matchups that will surely have the red-tops falling all over themselves in a quest to create controversy. England have played five games against this trio in major tournaments — and won none. France — who limped through qualification and progressed to the Cup by virtue of a heroic playoff comeback against Ukraine – will be booking their hotel stay at least as far as the round of 16. They face minnows Ecuador and Honduras, and one of the weakest UEFA teams in Switzerland. If Franck Ribery and his cohorts are unable to overcome that level opposition, they will have only themselves to blame. And Cote D’Ivoire, despite an opener against a fleet Japanese side that won fans and plaudits for their style at this summerâs Confederations Cup, also must feel this is a tournament in which they can go deep. Only Colombia, whom they will face in the brutal heat of Brasilia in their second game, presents a true challenge to the African giants.